To meet high demand in Chinese market and serve as bridgehead for export to the worldwide. DAEJEON--(Korea Newswire) February 13, 2012 -- Last December 2011, DAEMYUNG OPTICAL CO.,LTD(CEO Lee Kyung Seok), the country’s biggest exporter - statistics released by Food and Drug Administration medical device sector, announced that they completed expansion of their 2nd factory Zhejiang Hangzhou city in China and began operations. The 2nd factory has a floor space of 7,325 square meters (24,305m²) and it is a modern slab building factory which is capable of maximum 2.4 million pieces of monthly production capacity has enhanced the leading optical lens maker’s position in the world. This DAEMYUNG OPTICAL Hangzhou factory, with the first factory in Daejeon and a factory Ochang in Korea combined total floor space of 13,182 square meters (43,577m²), making the company with production capacity up to 50 million pieces years (based on casting capacity). In particular, all the lenses provided by DAEMYUNG OPTICAL are totally produced by its own factories without outsourcing, therefore, the high quality products which is ensured by DAEMYUNG OPTICAL’s quality assurance program is being supplied to 1.3 billion of Chinese local customers through the distributor network located in 25 regions such as Beijing and Shanghai with their own brand name “EOMA”. By enlargement of the 2nd factory, they predict to expand local sales, satisfy the fastidious demanding quality requirement of Chinese customer in order to extend their brand market share and furthermore, increasing in production volumes for that previously they could not respond quickly, so unlike the past, to meet the needs smoothly from many of global top buyers eventually. And also, as they installed high-tech machineries from overseas and integrated technology into their skills, now they are supplying all product lineup of index that Chinese market demand from CR to 1.74. Now, approximately 800 employees are working to serve Chinese local customers as their main target customer by observing their quality standard in accordance with ISO 9001 and CE in compliance with global quality standard. They have a plan to increase the ratio of the export to the world like Japan and Europe after increasing their production volume. 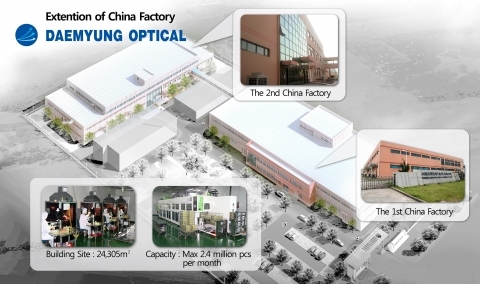 DAEMYUNG OPTICAL China factory is one of the finest network, connected to DAEMYUNG OPTICAL who is enjoying good reputation for technical performance, including factory in Daejeon working as a headquarter and Ochang factory which is equipped the latest Free Form facilities. Thanks to this system, close cooperative contact, support and strict quality control, DAEMYUNG OPTICAL China has no difficulties in producing best-quality lens which makes it possible to compete with other manufacturers among the rising ratio of Chinese local manufacturers. Not only lens, also DAMEYUNG OPTICAL China is adding fresh fuel to expand china domestic market, discover mid and big-sized chain stores and to promote best-qulity lens with an independent space at upcoming SIOF (Shanghai International Optical Fair 2012) – to be hold Feb 22-24. (Booth No.1A48/1B55). Domestic and Export sales are expected to be more active with the opportunity of supplying more quantity which is enabled by an extension of China factory. DAEMYUNG OPTICAL China also expressed that they will be establishing a bridgehead to boost sales for domestic and also all over the world. DAMEYUNG OPTICAL China has got a philosophy “Slow and steady following the right value, wins the race.” and by being encouraged by the strengthened marketing strategy, This will not be a contingency, but the fact. MARKETING TEAM, DAEMYUNG OPTICAL CO., LTD.